In any kind of hydraulic application, reliable valves are a must-have. But when you have fluids under very high pressure, you need to take extra care when choosing your valves. For valves you can rely on to perform in even the most demanding environments, choose Oilgear high pressure valves in San Pedro CA. While Oilgear’s own valve offerings are certainly capable of meeting many system requirements, for extreme pressure they also offer valves designed by 40-year valve industry veteran The Olmsted Products Co., which was acquired by Oilgear in 2008. This means that you can get both standard valves and specialty Oilgear high pressure valves in San Pedro CA designed specifically for your unique application. 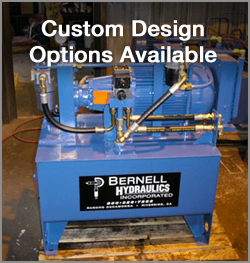 As a family-owned company that has been a trusted provider of Oilgear high pressure valves in San Pedro CA since 1977, Bernell Hydraulics can be relied upon to fill your orders correctly with authentic parts. Other reasons to shop with Bernell include the fact that we offer exceptional customer service and our staff will be happy to help you find the specific valves you need–as well as any other components–on our shelves or from the Oilgear catalog. Call us at 800-326-7252 now to order your Oilgear high pressure valves in San Pedro CA.